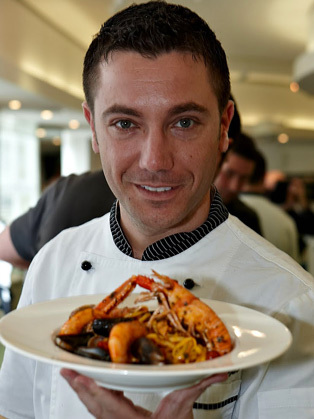 Gino D’Acampo was born in Napoli in the south of Italy into a large family. The food they ate was very traditional – simple recipes based on fresh and healthy fruit, vegetables, fish and meat. A good point well-made – and it’s a philosophy Gino has stuck to since he first started in the kitchen. When he was 11, he walked into his grandfather Ciro’s restaurant for the first time and decided that cooking was for him. After training at the Luigi de Medici Catering College, Gino came to London at 19 and worked at The Orchard Restaurant in Hampstead and then at the Cambio restaurant in Surrey. Working with Tesco on their Finest range led to his first TV appearance on Great Food Live on UKTV Food and a TV chef was born! With a cheeky smile and exceptional talent, he was well on the way to becoming one of the UKs most popular chefs. Gino is the author of several best-selling books including Fantastico!, Gino’s Pasta, Italian Home Baking. Gino’s Italian Escape - which accompanies the TV series exploring Italian food and the sites of Italy.